Billy Ward is one of the most unique and creative drummers you'll ever hear. As a performer, Billy has toured and recorded with “Blue Chip Artists” such as Joan Osborne, Carly Simon, Robbie Robertson, The Knack, Ace Frehley, Bill Evans, Yoko Ono. Billy played on B.B. King’s Grammy Award winning album, “80”. All told, Billy has played drums on more than 60 albums and 60 film soundtracks. His first solo album, “Two Hands Clapping” got a perfect 5 star rating in Modern Drummer which called the record “Album of the Year”. He has performed in clinics and master classes all over the world. 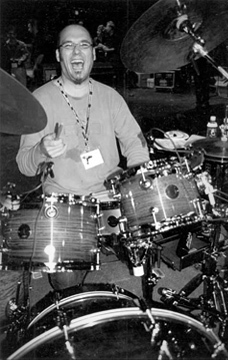 As a drum clinician, Billy inspires by emphasizing a more musical approach to drumming while at the same time re-enforcing the importance of drumming fundamentals. For five years, Billy’s been writing the much acclaimed “Concept” articles for Modern Drummer Magazine and serves on MDs advisory board. His book, “Inside Out... Exploring The Mental Aspects Of Drumming” is available through Modern Drummer Publications. The drum instructional video, "Big Time" received the Modern Drummer Magazine Reader’s Poll Award for Best Drum Instructional Video. Billy also was awarded the Eric A Bergquist Award for Excellence in Education in the Percussive Arts.